When you are ready to stop, this recording will help reinforce your commitment to achieving your goal. It is an empowering feeling when you stop a habit you no longer want in your life. 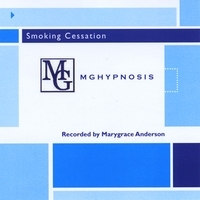 Hypnotherapy for Smoking Cessation. 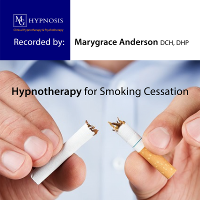 Marygrace became passionate about helping others by using hypnosis after experiencing first hand how incredible and effective it was in achieving her goal to stop smoking. She decided to master the technique to assist others in improving their lives. When you are ready to stop, this recording will help reinforce your commitment to achieving your goal. It is an empowering feeling when you stop a habit you no longer want in your life. This relaxation recording was created to help you find a little time in your day where you can unwind, relax, re-energize, and gain peace of mind. You will benefit more from listening regularly and finding a few minutes throughout your day to just relax. 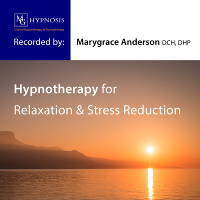 Hypnotherapy for Relaxation & Stress Reduction. This relaxation recording was created to help you find a little time in your day where you can unwind, relax, re-energize, and gain peace of mind. You will benefit more from listening regularly and finding a few minutes throughout your day - to just breathe. When you feel relaxed and centered it is easier to see and deal with stress and find solutions to problems or difficult situations. It is suitable for ages 10+. This recording was created to help individuals with motivation to set and achieve goals. The main focus is to set a target and write an action plan to help focus and achieve that goal. It incorporates motivational and planning techniques, and hypnosis. Hypnotherapy for Setting and Achieving Goals - Including weight loss, breaking bad habits, reducing alcoholic intake, changing careers, or achieving any life changing ambition. This recording was created to help individuals with motivation to set and achieve goals. The main focus is to set a target and write an action plan to help focus and achieve that goal. It incorporates motivational and planning techniques, and uses powerful hypnotic visualizations to help you reach your life changing ambition. To get the most from this recording it is imperative that you do the suggested activity in Track 1. Enjoy your success! This recording was created to help students with motivation, concentration and memory recall. The main focus is to help with reducing stress while preparing and taking exams. It incorporates study techniques and uses hypnotherapy. 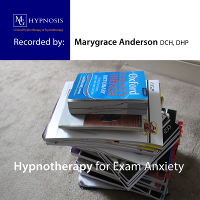 Hypnotherapy for Exam Anxiety (Including study techniques for motivation, concentration & memory recall). This recording was created to help students with motivation, concentration and memory recall. The main focus is to help with reducing stress while preparing and taking exams. It incorporates study techniques and uses powerful hypnotic visualizations to help reduce anxiety before and during exams, to assist with memory recall. It is suitable for age 7+. This smoking cessation recording was created to help you quit smoking. The artist used hypnosis to stop smoking and is passionate about helping others succeed. Do not listen to this unless you are 100% committed to quit smoking for the rest of your life! 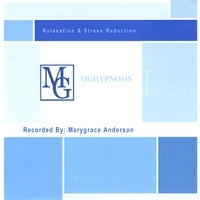 American born Marygrace Anderson is a qualified Clinical Hypnotherapist and Psychotherapist. She holds an advanced degree from the Institute of Clinical Hypnosis in London. Marygrace became interested in helping others after experiencing fist hand how incredible and effective it was with smoking cessation. She decided to master the technique to assist other in improving their lives. She offers Skype counselling and has another recording available called "Relaxation and Stress Reduction" also available on CD Baby. She is registered with the UK General Hypnotherapy Register and National Guild of Hypnotist in the USA. This relaxation/stress reduction recording was created to help you find a little time in your day where you can unwind, relax, re-energize and gain peace of mind. You will benefit more from the relaxation by listening to it as often as possible. 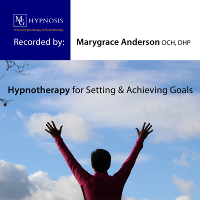 Marygrace Anderson is a certified Clinical Hypnotherapist and Psychotherapist. She holds an advanced diploma in Cognitive-Behavioral Hypnotherapy, a degree from the Institute of Clinical Hypnosis in hypnotherapy, counseling, and Emotional Freedom Therapy. She holds a BA degree from Regis University. MG Hypnosis has a selection of gift vouchers available for purchase. We have vouchers ranging from £75 to £300 and which are usable on the services that we provide. You decide the amount that you would like to spend and your friends, family and loved ones reap the benefits. "I love the CD. Your voice is so clear, concise, calming and reassuring."